I have been looking forward to celebrating Arnold Lobel's birthday with my children for quite some time. The stack of used books that I have been collecting, including Mouse Tales and Whiskers and Rhymes, was ready to be read. The Frog and Toad series was checked out from the library. I expected it to be an exciting week of reading all of Arnold Lobel's classic stories for the first time to my children. 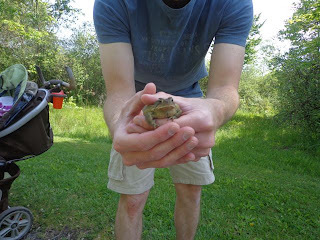 What I didn't expect was for my family to actually meet the real Frog and Toad. And our experience with Frog and Toad...well, let's say it was... thrilling...dangerous...and it was like no other author birthday celebration. My son was pedaling his bike on a path around a lake near our house. I had fallen off his pace while pushing my other two children in the stroller. The next thing I know, my son was running toward me. 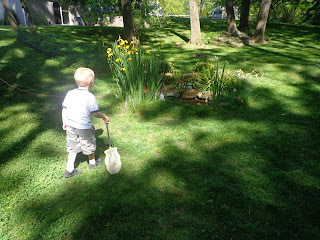 "Dad, there is a snake!" I raced ahead. We got a quick look at it on the path. Then, in my rush to get my camera out of my pocket to take a picture, I scared it away. I was upset that I wasn't more delicate with my actions. I didn't get a photo and I wasn't able to identify the species. 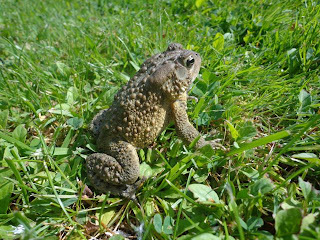 My son turned around and right near the path, just a few feet from where we saw the snake, he saw Toad --frozen in fear. We knew it was Toad right away because we had just read Frog and Toad Are Friends the night before. Toad even let me get really close for a few photos. What a handsome fellow! As my youngest son was introducing himself to Toad, I realized that I might have saved the life of this famous children's book character. The snake I scared away was big and certainly capable of eating our famous amphibian. 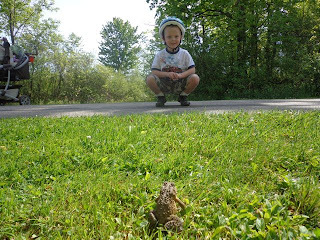 Toad eventually loosened up and let my son chase him around the path. Before parting ways Toad and I hugged. He thanked me for saving his life and I thanked him for his great books. When we got home, my son wanted to tell Frog all about what happened. 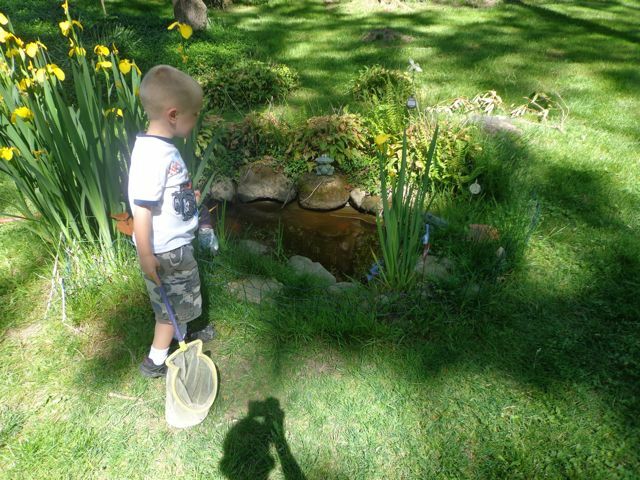 We knew he lived in the pond in our backyard. Frog is very friendly and approachable in the books however we knew that we would have to catch him to get a chance to talk to him. 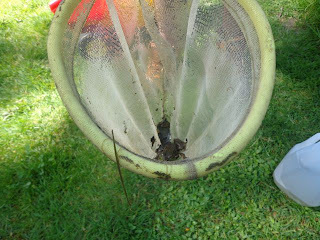 I was patient and after a few failed attempts I caught Frog. 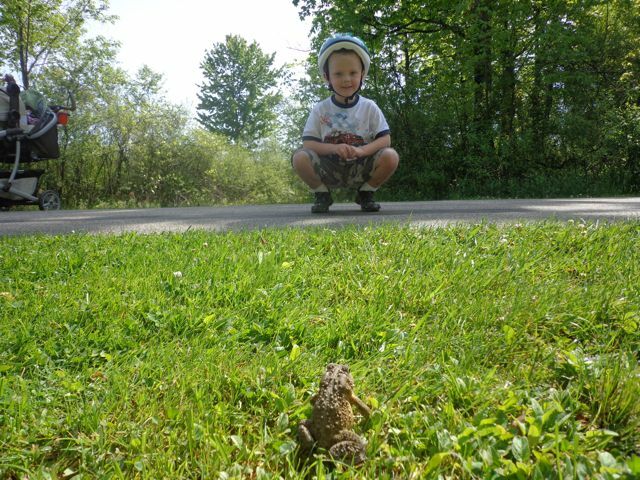 I told him all about the snake and saving Toad's life. 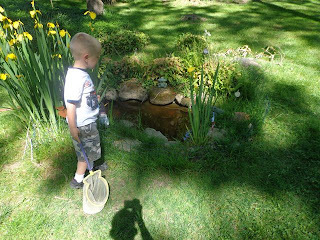 He thanked me and asked me politely to let him go back to the pond. 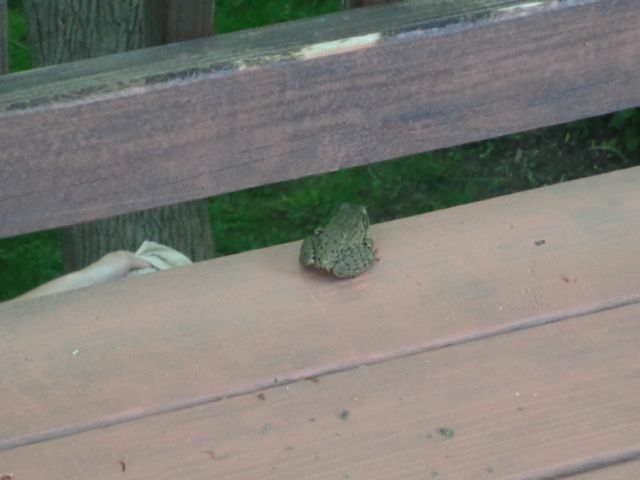 I closed up the top of the milk container and placed Frog on our deck (which sits about 12 feet off the ground). I was cooking dinner on the grill and I realized that the container was EMPTY! 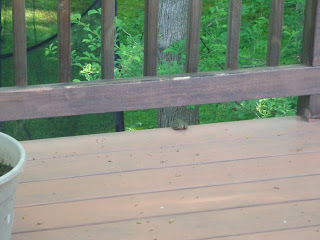 I looked around on the deck -- no Frog! 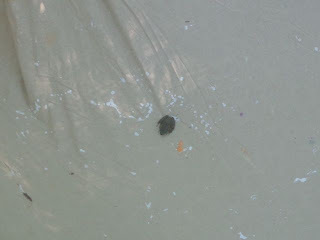 I nervously looked down below the deck -- no Frog! 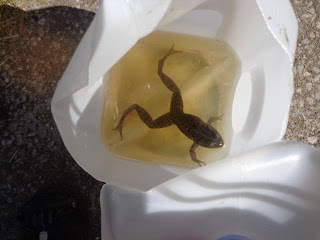 I double checked the container -- no Frog! I felt awful. I thought, "Today, I saved the life of one famous children's book character yet I managed to end a life too!" We ate dinner outside and then while I was cleaning up the dishes I looked over and saw Frog. He was contemplating a jump that would probably be his last. 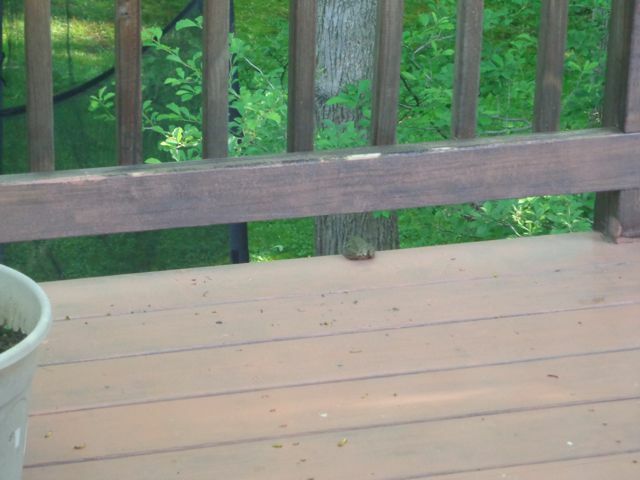 I knew if we went near him or said anything, like "HEY, Frog, Don't Jump," he would get scared and jump. I made a quick decision and realized that jumping actually was the best option for Frog. My daughter and I ran downstairs to get an old painting sheet. We positioned ourselves where we thought would be the best place -- but we really didn't know how far Frog could jump. 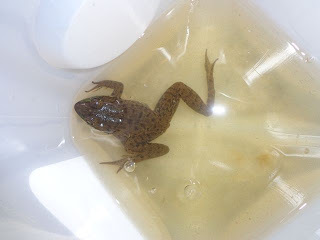 I was thinking, "Frog, I am really sorry for putting you in this position." Then, on the count of three my wife scared Frog into plunging off the ledge. Frog made a safe landing in the middle of the sheet. 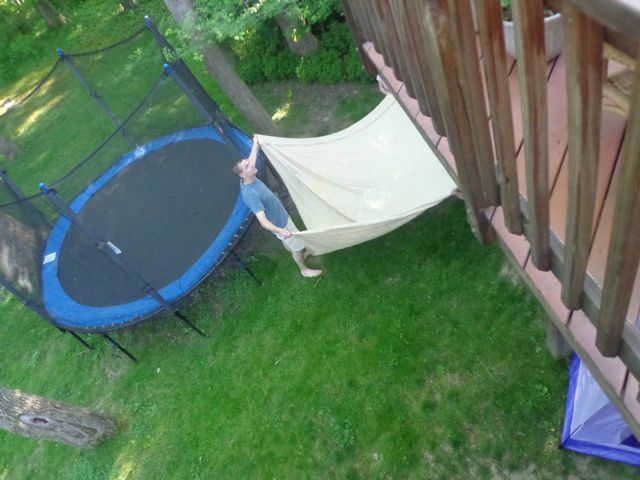 He jumped off, waved goodbye and went into the backyard. I was relieved! Two lives saved in one day! Frog and Toad will continue to live on and on. Arnold Lobel won the 1981 Caldecott Medal for Fables. He won Caldecott Honor for On Market Street by Anita Lobel (1982), Hildilid's Night by Cheli Duran Ryan (1972), and Frog and Toad Are Friends (1971). Really cute! We ran into a big snapping turtle! I think I'd have rather met frog and toad! A snapper! Yikes! Those guys can be huge! Wow! What a story! Frog and Toad must be still reliving their adventures. Thank you for saving two of my favorite characters. I love this post!!! Thank you Iza! I am so happy they are safe too! Holy cow, what a story, and how fabulous that Frog and Toad came alive for your kids. I must admit that I would not have picked up Mr. Toad, but he seemed like a jolly fellow after all. The backyard is one reason we chose our new house. We are so blessed to have it! We would love to have you if you are ever in Ohio! Oh my goodness! What an adventure! I love Arnold Lobel, and Frog And Toad are among my favorite stories of all time - frequently quoted and always looked to for inspiration as models of the very best in early readers! My son must have said, "That was a funny story," after at least half dozen of the Frog and Toad short stories. They are a must read it my mind. Great idea to use them as inspiration for writing! Hooray for Frog and Toad! Didn't know amphibians could be so compliant as to jump on 'command'! Or that toads took to the road! Very nice post! Not all amphibians, just famous children's book character amphibians! Thanks Elizabeth! Glad you stopped by! I am so glad the sheet worked...imagine if it hadn't?!?!? Eric, you are awesome. I'm just sorry they weren't wearing their vests for your photos. 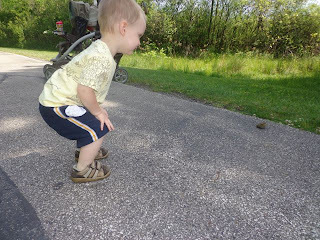 At any rate, now Frog will have an excellent story to tell Toad next time he's not feeling well. I wanted to celebrate his birthday last year and read the Frog and Toad books, but life happened. So, I was finally able to read them this year. My kids loved them -- especially my "Toad" reading voice. The day couldn't have been more perfect. We met Toad in the morning and Frog in the afternoon! Delightful! You are amazing, Eric! Not sure if I would have had the nerve to pick up toad or even to run and try to take a picture of a snake...yikes! What an adventurous day it was for storybook characters and your family. I know I had loads of fun reading about you fun day. This story is looks like a job for one of Renee's poetry videos. Toad really wasn't a touch feely fellow, but at least I got a hug. My days working at the zoo really helped my comfort level with handling wildlife - snakes surprisingly were the easy to handle! The comment above looks like a job for proofreader. Embarrassing! I can't imagine how many typos and errors are in my posts - and I proofread over and over! No worries Pam! Now that was fate, how fun! My first stories were about frogs and toads after reading Frog and Toad stories. I love how you live these posts as well as write them. Great stuff! It was fate! I couldn't have planned this birthday celebration! You superhero you! Thanks for saving Frog & Toad, Eric. I love those books. 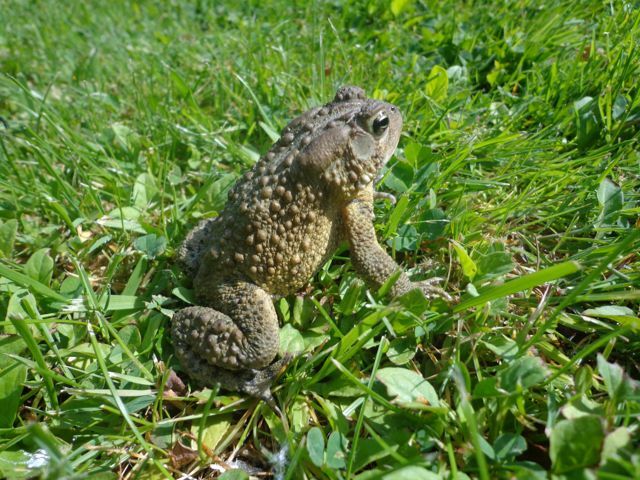 And I had a backyard toad for years-- came nose to nose with him/her when weeding one day. S/he lived within the walls of our yard for years & may still be there. I love having frogs as companions in our backyard! 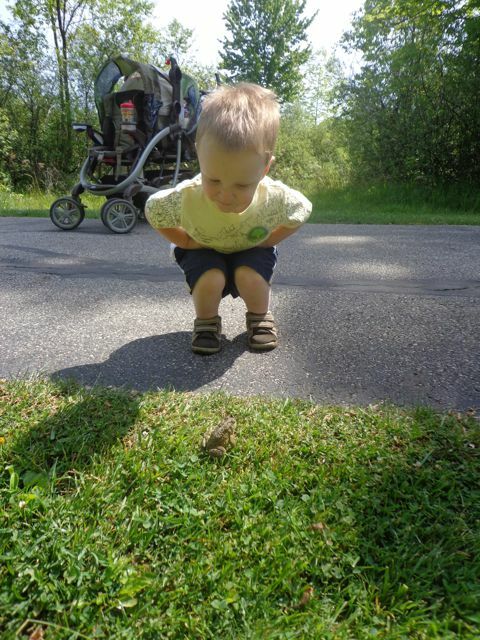 Frog& Toad is one of our favorites, and your frog and toad pictures are awesome! We've only spotted little frogs around our house. Not quite as exciting as the giants you have pictured here. I like the little frogs and toads! I remember my kids found a whole bunch picking strawberries last year! Funny, funny stories, Eric. Super celebration.